Click here for Ha image. Click here to view retired image. 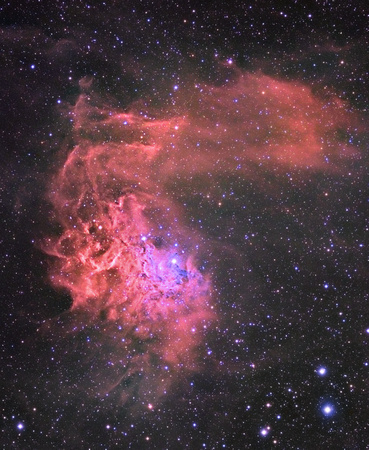 IC 405 the Flaming Star nebula is an emission and a reflection nebula located in the constellation of Auriga about 1,500 light years away. 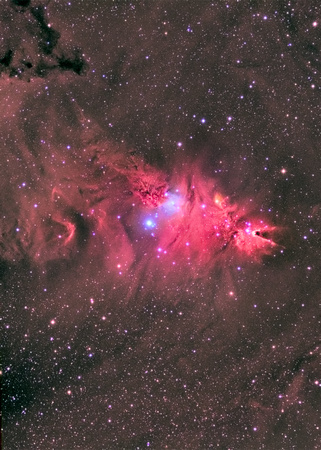 The central blue region is from light reflecting off of dust granules from the nearby star AE Auriga. 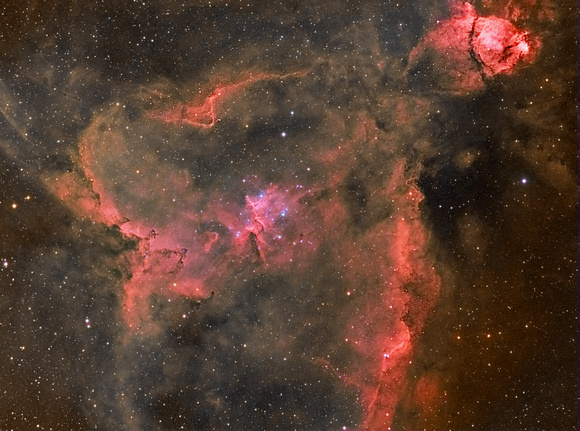 Imaged December 19, 2012, January 9 and January 10, 2013 from Ocala, Florida. Click here to view Ha image. 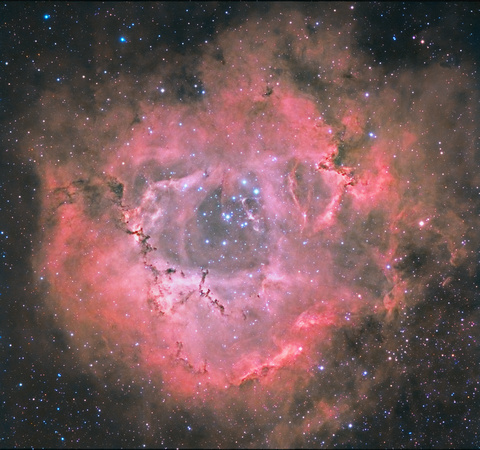 Rosette nebula (aka NGC 2237, NGC 2238, NGC 2239, NGC 2244, NGC 2246) is an emission nebula associated with open clusters of stars located in the constellation of Monoceros, 5,200 light years away. Imaged December 29 and 31, 2011, January 6, 2012 from Ocala, Florida. 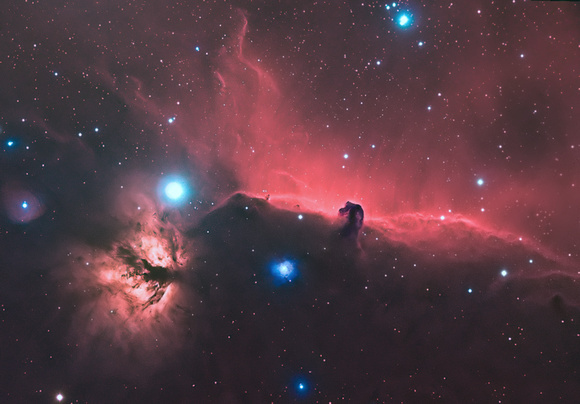 Ha data: 15minute exposure stacked in DSS for a total of 2 hours and 45 min. 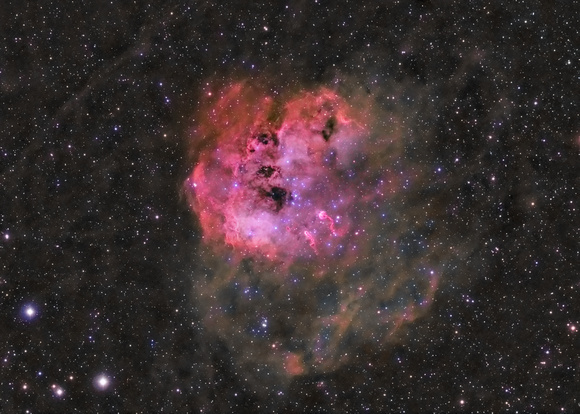 IC 410 an emission nebula about 12,000 light-years from Earth in the constellation Auriga. 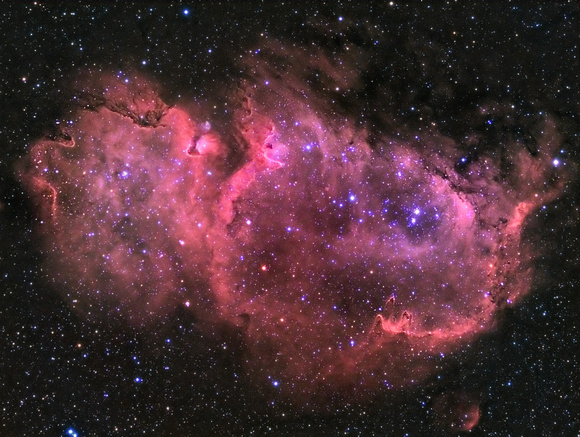 Near the center of the nebulous region is a star cluster ( NGC 1893) and just to the bottom right of this cluster lies two structures that resemble tadpoles. 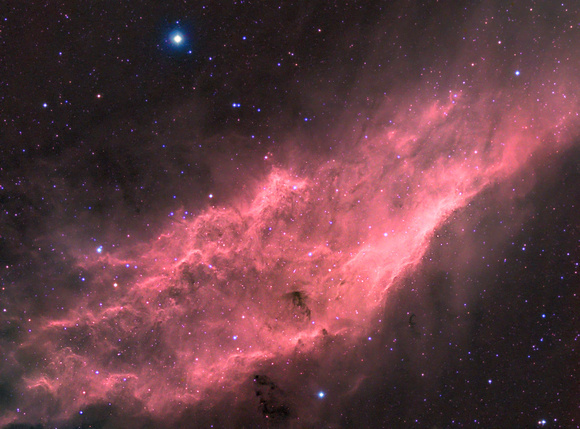 These structures are made of leftover hydrogen and dust from the formation of the star cluster and the "tails" are from the solar wind coming from the stars of NGC 1893. Emission, reflection and dark nebula ~1,344 light from Earth lacated in the Orion constellation. 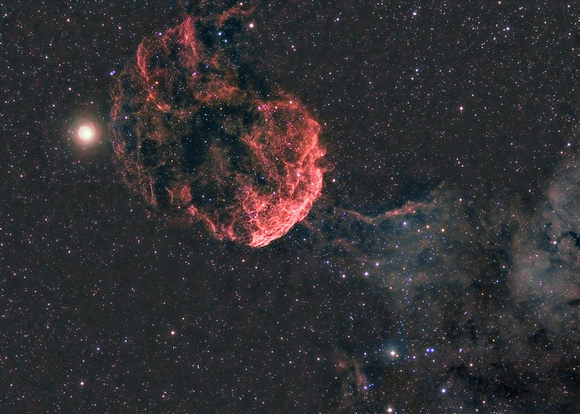 Supernova remnant located in the constellation Gemini about 5,000 light years from Earth. A supernova remnant is the material expelled from a massive star that burned up all of it's fuel and collapsed onto itself. Thanks. I'm impressed with what you've been able to capture. My location is suburban, Bortle scale 5 or 6 (6 to the south for sure), but I rarely even attempt LRGB imaging - it's 90% narrowband. But I do like the advantages of a small refractor! My skies are city, Bortle scale 7. Summertime is tough, hot, humid and often rainy as the day wears on. Fall, Winter and Spring are near perfect with clear skies (excellent transparancy and good seeing) and I am low enough to image lower hemisphere targets (Helix/Sculptor). All great images, Steve. What are your typical sky conditions in terms of darkness and seeing?